The Hill had visions: The late Christopher Hill developed the superfood spirulina as well as this goddess temple in Boulder Creek. Erik Davis claims he was born and raised a California heathen in the sense that he was never baptized and instead found himself tripping around with yogis, monks and even born-again surfers. He's ridden the wave of every bizarre spiritual skein making up this land we call California, and he's written about everything from virtual reality shamans and Extropian transcendentalists to ravers and technopagans. He even employed rock journalism as alchemy to analyze Led Zeppelin's fourth album. So it only makes sense that his latest venture is a mammoth tag-team effort with photographer Michael Rauner, a glossy elephantine photo/text exploration through all of this state's bizarre spiritual trajectories. 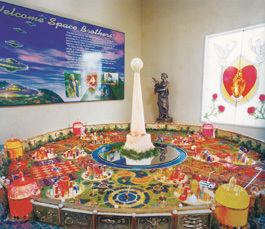 In The Visionary State: A Journey Through California's Spiritual Landscape (Chronicle; 272 pages; $40 cloth), Davis and Rauner uncover a landscape that is uniquely Californian in scope. You just can't grow up in North Dakota and get exposed to druid libraries, high-tech pop occulture, teen Wiccans, EST seminars, a satanist with a roomful of mannequins in his basement, Deadheads, tantric yogis, LSD mystics and Hare Krishnas all as part of the same topography. 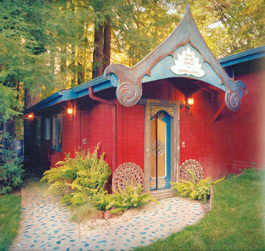 Consider the book a Bay Area Backroads episode, but instead of the Mystery Spot, you've got an elaboration on the history of the goddess temple that Christopher Hills built among the redwoods in Boulder Creek. That particular chapter is titled Kalifornia. "It was both out of intellectual interest in the history of alternative spirituality, which is an abiding interest of mine, but it was also a personal quest," says Davis of the motivations behind the book. "I wanted to know about the forces that shape me and so much of what I still do." Santa Cruz pops up in another chapter with Davis calling to our attention that "some Wiccan priestesses have even characterized California's physical territory as the mystic body of the Goddess, with her second chakra located in Los Angeles, her spine along the Sierras, her breasts dangling over Santa Cruz, and her crown chakra erupting at Shasta." Rauner's photographs and Davis' texts completely play off each other, and although Davis had most of the research done by the time Rauner came on board, this project would not have worked without the photographs. As soon as you open the book, the first photo shows a shot of the Self-Realization temple on a beachfront cliff near Encinitas with a surfer crossing sign in the foreground. That "only in California" photo rightfully sums up the entire book, providing the reader with a perfect breakdown of what's to come. "As soon as I saw that conjunction, I was like, Oh my God, this has to be the photograph, this has to be the icon of the beginning of the book," says Davis. "Because it totally expresses the conjunction of popular culture, of outdoor hedonism and this kind of exotic theme park quality of so much of this alternative religious strain in California. So I was very insistent that Michael get a good photograph of that place." Welcome, space brothers: Unarians preview their Earth City of the Future at an interplanetary learning center in El Cajon, Calif. So Davis journeyed in, around and between all these different spots and stories, his exploration taking the form of psychogeography, a subconscious drift through places with no intended final destination. Taken from the Situationist International, a radical French art and political movement in the '50s, psychogeography is related to the concept of dérive, which translates from the French as "drifting" and in Situationist parlance refers to locomotion without a goal or to a mode of experimental behavior having to do with a technique of rapid passage through varied ambiences. "When I first realized that I wanted to tell the story in terms of visiting these places--obviously that implies a kind of geographical way of organizing it--but I didn't really discover that deeper element until I was actually on the journey," Davis explains. "I think one of the attractions of psychogeography is that it reinvests a sense of place that many of us don't have, probably because the world we live in is increasingly placeless, increasingly incorporeal--we spend more time in front of screens or on phones. Also, every place is beginning to resemble every other place, especially in California, with strips malls and housing developments, yaddah yaddah yaddah. It really erodes our sense of place. And doing the kinds of journeys that I have been--seeking out these traces of these older stories, it really transforms my relationship to place. So for me, psychogeography is not just about telling stories that are hidden in the land, but a kind of reenchantment of the landscape. ... It's like an invocation of ghosts. ... It's not just like empty history in a history book, it's about different layers and strata of the cultural geography. ... In order to combat the existential emptiness of the endless strip mall experience and this kind of desert of crap, it becomes a way of [seeing] local history as a survival mechanism, as a way of reimagining, not just as a way of passing the time." Situationist Guy Debord explained psychogeography this way: "The sudden change of ambience in a place within the space of a few meters; the evident division of California into zones of distinct psychic atmospheres; the path of least resistance which is automatically followed in aimless strolls (and which has no relation to the physical contour of the ground); the appealing or repelling character of certain places--all this seems to be neglected." Which is precisely why this book needed to happen. You just want to aimlessly explore these interstitial places and get the stories yourself. Why go to the San Diego Zoo when you can go up the road and visit sporting goods king Albert Spalding's old residence, one of the few structures remaining from Lomaland, a turn-of-the century occult community devoted to reviving the lost mysteries of antiquity? If you're in Culver City, who cares about Sony Picture Studios when you can go check out the King Fahd Mosque? And how can you possibly visit Marin County without trying to locate Druid Heights, a legendary beatnik enclave where everyone from Alan Watts to Neil Young showed up? Well, Davis did all that. "I did it mostly just as an excuse to get out--to go visit different parts of the state that I hadn't been to," Davis says. "And also to make it more of a personal pilgrimage. By going to these places, I felt like I was picking up something, some energy, some atmosphere, some quality of place. It was communicating something that I wasn't getting just by doing the research or interviewing people." Erik Davis will be reading in Santa Cruz on Thursday, Oct. 5, at 7pm at Gateways, 1126 Soquel Ave., Santa Cruz; 831.429.9600.